At the prom boutique I worked at last week, there was a booth selling something I didn't recognize. That's a rarity for me when it comes to direct sales companies. It was something called Posh Boutique. It reminded me of Lush, and I loves me some Lush. She had set up body butters, bath bombs, lotion bars, lip balms. I was in girly spa heaven. One of the first things I noticed about the products was the scent. Julia, the consultant, had an entire table of them, but the scent wasn't crazy-strong. Sometimes when I visit other stores (which shall not be named), I am overwhelmed by the smell. It always smells good, but after a few minutes I get a headache. With Perfectly Posh, it smells amazing, but not overpowering. Julia was gracious enough to give me some product to review. The Bominator in Slap! Wired Mango Caffeine Fizz, Chunk! Bath Bar in Chatter and Lipshot LipBalm in John Doe. I tried the lip balm first since I could pop the top off and use it anywhere. John Doe is a minty detoxifying formula. I'm not sure how to tell if my lips have been fully detoxed, but I do know that they're really soft. My lips absorbed the product without leaving a greasy film. I noticed a lasting difference from this one! The bath bomb smells delish. I have a little mango obsession, so this was right up my alley. The caffeine in the product isn't to wake you up, but to reduce cellulite. I think it will take me a few more baths to reduce this girl's unsightly dimples, but I have that chance. Each Bombinator has multiple uses. Just place it in a plastic bag and drop it on a hard floor. I can't wait to use it again! The Chatter soap is a citrus-scented bar of luxury. It's really moisturizing with natural glycerin. And at 7 oz., it will last me a while too! I'm not used to using bar soap, but this might have converted me. It gave me soft skin while still making me feel clean. That's impressive coming from a girl who loves her bath pouf. 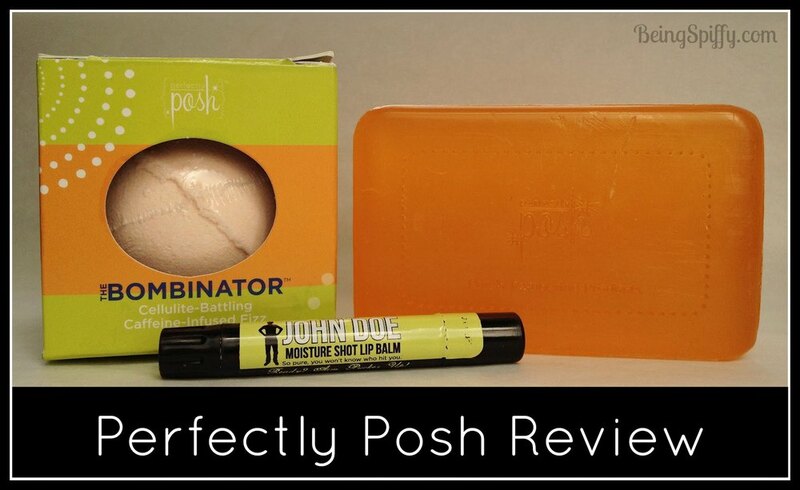 All-in-all, Perfectly Posh gets a rousing thumbs-up from me. Prices are spot on for the quality and Julia was super fun to work with. If you want to order your own Perfectly Posh products, be a hostess or sign up as a consultant, visit Julia's website.